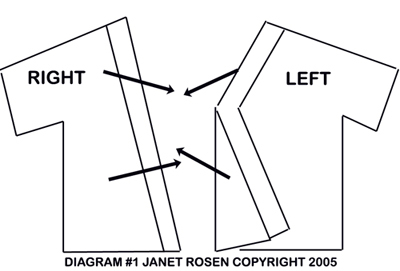 Customizing the Dogi by "The Mirror"
This column was written by Janet Rosen. I'm a tinkerer and putterer, so it was only natural that soon after buying my first aikido dogi I set about discovering how to improve it for function and fit. If you have ever had similar desires but have not been sure where or how to start, here are three projects. (1) For women: Adding "modesty ties" to the gi top requires the ability to do a basic hand or machine stitch. (2) For women: Putting in an elastic waist requires the ability to do a basic machine stitch just to secure the elastic to itself, or access to a friend with a sewing machine and five minutes to spare. (3) For anybody with knees: Adding padding to the knees requires machine sewing skills and the ability to follow pattern instructions. This is such an easy thing to do and yields such benefits that I don't understand why it's not more popular! I don't like a lot of layers of clothing under my gi top, but I also don't like to be distracted by thinking about my cleavage. I have experimented with a variety of closures, including snap tape and velcro, and am happiest with a pair of white or natural (to match the dogi fabric) sneaker shoelaces. One lace cut in half will secure the waist, the other cut in half will secure the lapel. Put on the gi top, over the gi pants and belted as usual, and use straight pins to locate where you want the ties to be. For the waist ties, the left side tie will go on the inside of the top (wrong side) and the right side tie will go on the outside of the top (right side). For the upper lapel ties, the right side tie again will go on the outside of the top (right side), but it is easiest to secure the ties if the left side tie is directly at the edge of the gi top. The ties can be sewn in place by hand or by machine. Machine stitching is recommended, as the hand-sewn ties seem more prone to become separated from the fabric. I hated the drawstring closure on my pants from day one! They were a nuisance to align, to keep tied, and they never seemed very secure. One day in utter disgust I pulled the drawstring out and replaced it with elastic. From that day on it has been the first modification I make to every dogi I purchase. This is not recommended for men or for slim-hipped women. There needs to be enough of a difference between waist and hip measurement for the elastic to stretch over the hips and snug in at the waist. Otherwise, if there is any downward pull (think shikko, suwariwaza, rolling...), it may prove very embarrassing! Remove the drawstring. Measure the height of the casing; on all the gi pants that I've had regardless of manufacturer, it would hold 3/4" waistband elastic snugly, but best to measure your pants and get a narrower 1/2" elastic if need be. I like a type of waistband elastic that is a flat ribbed band, specifically made for waistbands without any ties attached. It can be bought either by the yard or in a package. Figure out the required length of elastic. My rule of thumb is that the elastic, unstretched, should be about 80 to 85 % of my waist measurement. Then add 2" for overlap. Attach a large safety pin to one end of the elastic and use it to insert the elastic through the casing. The pin gives you a nice solid object to push through the fabric. Before you get too far, pin the other end of the elastic to your gi pants in order to anchor it. When the safety pin with the elastic emerges from the waistband, double check that the elastic has not twisted within the casing. If it has, work it around to smooth it out. Remove all pins. Lap one end of the elastic over the other to make a continuous circle, with a full one inch overlap from each side. Pin in place. Use a moderately wide, short zigzag stitch to edgestitch a rectangle along all 4 sides/edges of the overlapped section. 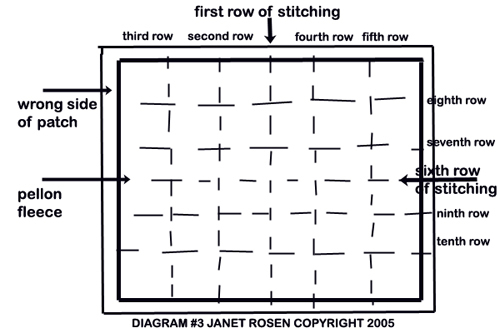 With the same stitch setting, run 1 lines of stitching down the center of the overlapped section. Stick the sewn section of the elastic into the waistband casing and move the elastic about to "even it out" within the waistband. Once the elastic is evenly distributed you can either hand sew the side seam slits of the gi pants together around the elastic, or pin the sides together at the side seam slits and machine sew a seam that both closes the slits and anchors the elastic. Put on the gi pants and mark the 4 corners where you want the padding on each pants leg (I use a straight pin into each corner). Make sure that you knee walk and roll in order to get the area the right size and position: I ended up with an area about 10" square that started quite a bit lower than my knee when standing, and slightly off-center. Purchase the amount of pellon fleece and backing fabric you need to do two pads (one for each leg). You will be putting the fabric next to your skin. Very lightweight muslin will not hold up to wear and washing because the fibers are so far apart in the weaving. It needs to be densely woven for durability, and fairly smooth for comfort. A very lightweight canvas, denim or twill would work. Preshrink your backing fabric (NOT the pellon fleece) by running through the laundry at the same settings you normally use to wash and dry your dogi. Place one piece of pellon on the "wrong side" of one piece of the backing fabric--whichever side you DON'T want against your skin. It may be easier to handle if you trim the pellon 1/4" smaller than the patch. Pin in place at the edges and also at a few places in the middle. Starting at the middle of the top edge, sew one line of straight stitching down the middle of the piece to the bottom edge. Sew another line parallel to it a couple of inches to the left of the first seam. Repeat a couple of inches to the right of the first seam, and continue to sew parallel seams until you reach the edges. Then turn the fabric 90 degrees, and starting at the middle of the top edge, repeat the process. 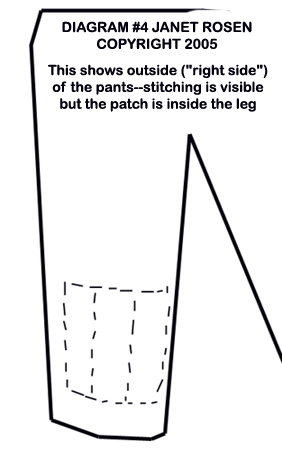 Set the patch into the leg, pellon surface against the inside surface of the gi pants, matching the 4 corners you'd marked with pins. Make sure the pellon is sandwiched between the gi pants and the backing fabric. Pin in place and put the pants on to double check placement; adjust if needed. Using a free arm sewing machine, or hand sewing with tight small stitches, sew around all four edges. Then sew a couple of vertical lines through all layers.